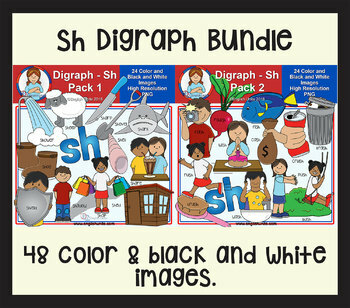 Clip Art - Sh Digraph Bundle (Sh Pack 1 & 2): This set contains all of the images shown - 48 images (24 in color and the same 24 in black and white). The bundle includes an additional 24 images saved as darker line black and white images. Use the lighter line black and white image for larger images and the darker line for images what will be reduced. The images are saved at 300dpi in transparent PNG files. Images included from pack 1: shadow, share, shark, sharp, shed, sheep, shell, shield, shoe/shoes (image saved as one shoe and a pair of shoes), shop, shovel and shower. Images included from pack 2: brush, bush, cash, crush, fish, flash (saved as boy with camera and camera only), push, radish, rubbish, rush, wash, wish and sh word art (bonus). * Please note: the words around the images are not included in the download. Files contain images only. Follow me on Facebook to ensure you don't miss out on new product listings, freebies, and flash freebies by clicking here.